At last – wet fins! Getting our fins wet. Ocean predators below! We hadn’t been scuba diving for ages due to various circumstances, but at long last we were back in the water. Not the open ocean yet, but the Predator Exhibit at the Two Oceans Aquarium. To mark Significant Other’s birthday, we decided to risk life and (especially) limb with a scuba dive in the shark display at the aquarium. We arrived early and eager with all our gear in tow and were promptly met by the aquarium’s dive master. Models were pretending to be mermaids in the centre of the clownfish display. Never a dull moment at the aquarium it seems. The dive master led us through the working bits of the aquarium and up to the top floor. There we were joined by the third member of our party, a Russian army medic who did not seem to speak a lot of English. We had our gear laid out and our wetsuits half on when we were told there would be a delay: the US film crew and models who had earlier found Nemo, had moved their operation to use the predator tank as their new backdrop. Another, longer delay followed: it seemed that one of the raggies in the predator tank had taken a bite out of a yellow tail during the night. The victim was still happily swimming round and round with its mates, but had the distinction of a perfect ring of shark teeth marks on its back. 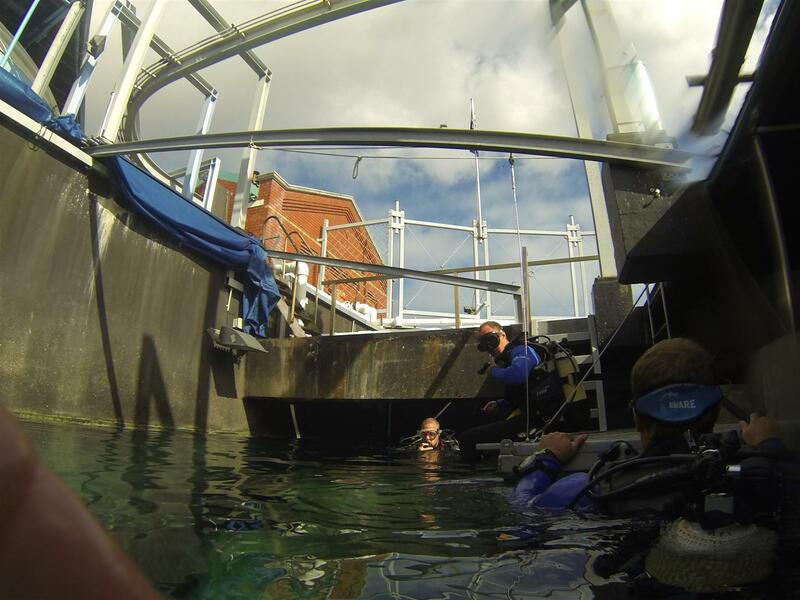 Two aquarists were suited up in scuba gear to try and catch the damaged fish and move it to another tank. (The prognosis for the yellow tail was that it would probably survive, but it wasn’t a very nice sight for the public). The idea was that one of the aquarium divers would herd the school of yellow tails towards the other one, who was waiting with a device that looked like an oversized condom. Good theory, but the fish had other ideas. As we watched from above, all the inhabitants of the tank went round in ever faster laps – not unlike Formula One – but not even one fish ended up in the ‘condom’. Eventually the aquarists acceded round one to the wily fish and we were given the all clear to dive. 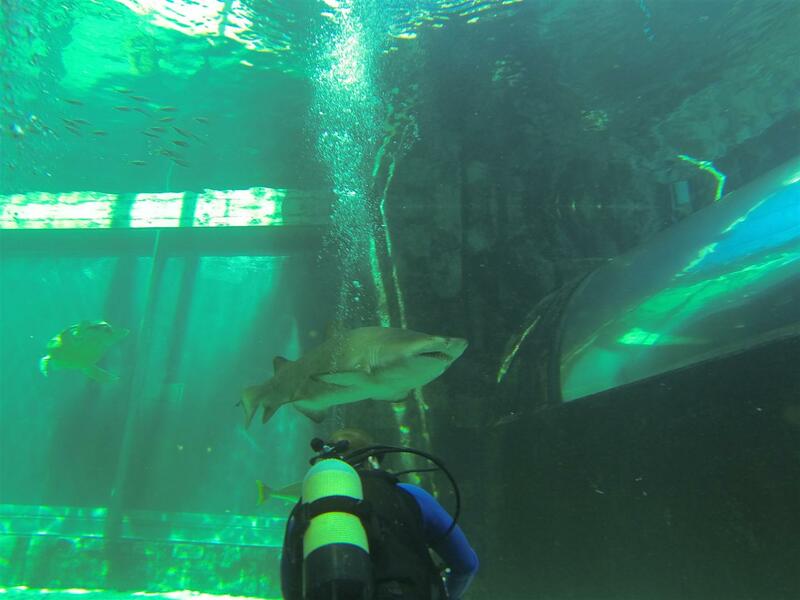 As excited as I was about the experience I must admit to a bit of worry at the back of my mind that we were getting into the tank just when all the fish, including the sharks, had been chased around by divers. Having caught a glimpse of the teeth on those sharks and seen first hand the damage they can do, I hoped we would surface with all our bits still attached. I had specific instructions from my boss: he didn’t want to see our dive as a spectacle on Youtube. We got onto the platform, pulled on our fins and made our way to the bottom, only about 5m below. As soon as I looked around me I was in awe. Rays were gliding majestically around us. I was able to touch one and was surprised how it felt. I expected to feel wet sandpaper, but the rays feel soft and slick. 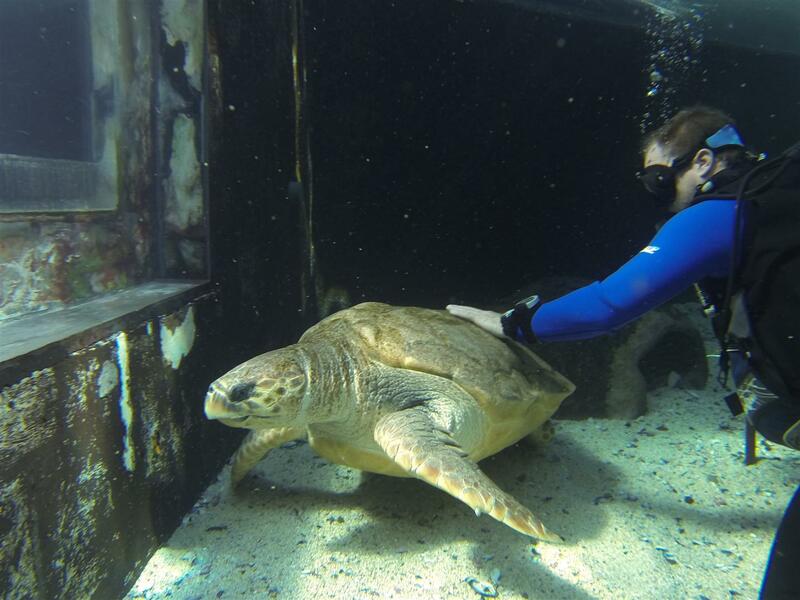 Yoshi the 120kg loggerhead turtle acknowledged me with a brief sideways look when I scratched her leathery skin, then went back to puckering up for the fans in front of the giant windows. And then of course there are the raggies. These guys are an orthodontist’s dream: huge overbites and row upon row of crooked teeth. Those teeth look like huge cat claws, and if any fall out there are lots in reserve too. Apparently the reason why raggies don’t have the fearsome reputation of the great whites or the tiger sharks is that the initial bite of the raggie is not accompanied by the deadly thrashing of the other fellows. That said, these sharks can still do serious damage and need to be treated with respect. We spent about forty minutes in the tank which gave us a lot of time to calmly move around and experience its wonders. All too soon though our time was up and we headed back to the surface. Once out of the tank it was evident that our Russian fellow diver actually knows quite a bit of English! He started gushing about the experience – and I couldn’t agree more. 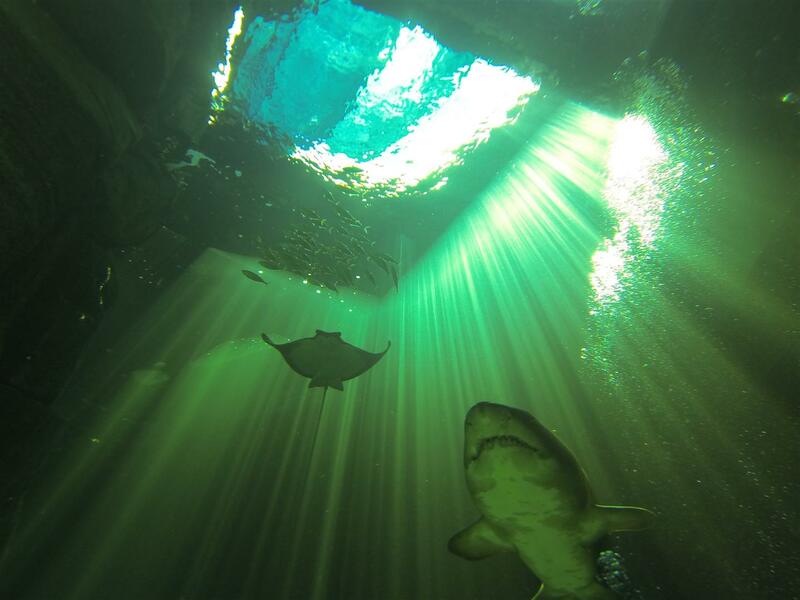 If you are in Cape Town and have a diving certification, go take the plunge at the Two Oceans Aquarium!